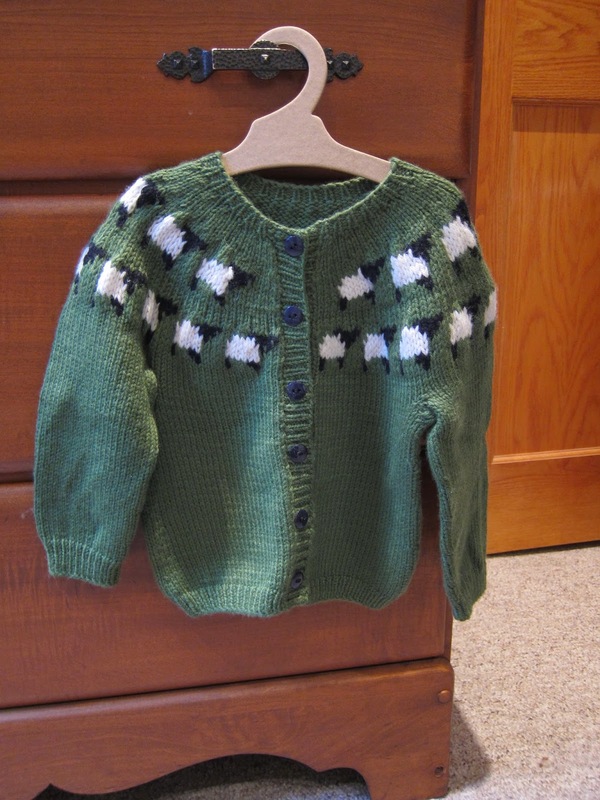 I first saw this wee sheepie cardigan on the Yarn Harlot's blog and just knew I had to make one for our little guy. Stranded colorwork and a fairly fine gauge meant that there was no way I was making a teensy size, since if it's that labor-intensive, it ought to fit for quite a while. Love the pattern and the cozy little cardigan! The Capra DK-weight cashmere/merino-blend yarn was super soft to knit and looked absolutely gorgeous at first. As I had feared, it does pill. In fact, it pills a LOT. Very disappointing, as it's already beginning to look ratty. I'll need to dig out the sweater shaver and see what I can do. Also, I knit this yarn at a tighter gauge than I'd like -- next time I'd use a thinner yarn. The buttons aren't ideal (a little thin and flimsy), but I realized that I had better sew on some buttons asap so that Erik could wear it as long as possible. So, in a nutshell: great pattern, super cute result, but I wish I had used better materials. Old Man Winter is making his presence known here in Chicago. Brrrr! Temps below zero, windchills in the -20s. At least we have sunshine and a nice coating of snow! 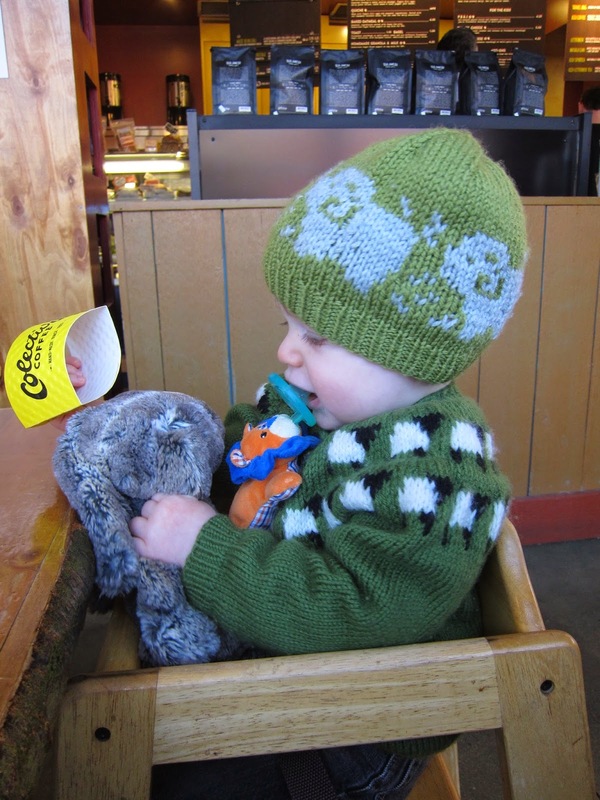 It's hot cocoa and mitten season at last. I knit these cozy mittens for my soon-to-be sister-in-law for Christmas (yay!). They're from Martha Stewart's website, and you get the feeling that the designer or editor wasn't familiar with standard knitting patterns -- very odd instructions, abbreviations, and formatting, but the mittens themselves were fun to knit. Clever construction. You knit them flat, and you start with the thumb and work the mitten sideways, if that makes sense. 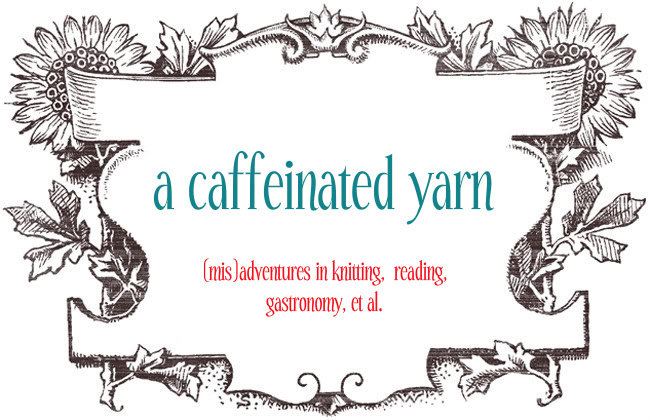 There's a bit of origami at the end, and you finish up with a crochet seam. You're supposed to crochet around the cuffs, too, but I was down to the wire for holiday gifts, so that didn't happen. I recommend the pattern if you want to try something different, don't like fiddling around with DPNs for mittens, and don't mind some unusual directions! Wishing you peace and joy in 2015! The holidays were a whirlwind of activity -- we did our usual Upper Midwest tour, made more intense by a busy toddler, plus an extra weekend trip to Milwaukee for a family baby shower (well worth packing up the car again). 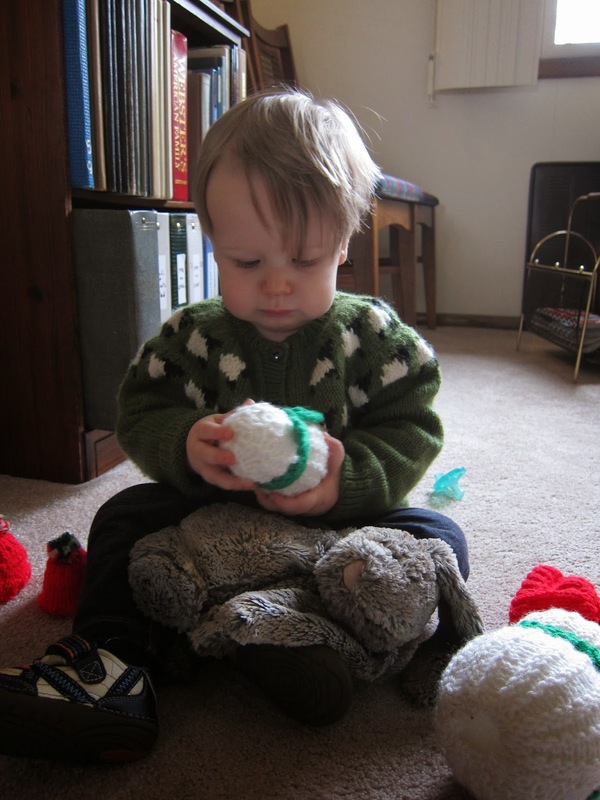 December was quite a productive month knitting-wise, so there's plenty to catch up on. 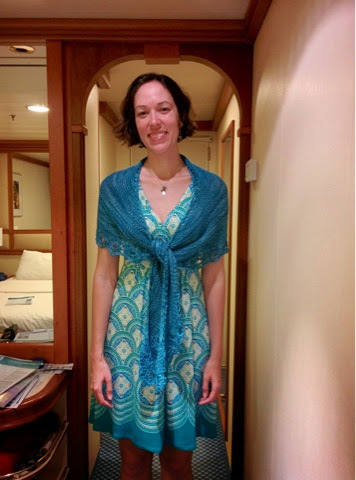 This super soft and cozy faerie ring shawlette finally received a blocking and was given to a dear friend for her birthday. Emily wears it well and looks quite glamorous! I usually scrunch up my shawlettes and wear them as scarves -- she really knows how to bring it. Lovely lace edging, and an easy pattern! I don’t like the instructions for the beginning, though -- I ended up with an odd-looking large hole that I jury-rigged when weaving in ends. I think the designer has updated the pattern and improved the directions now.